The mobile revolution has been dubbed by many as the trillion dollar revolution. While it is still hard for anyone to quantify the overall economic impact of the mobile revolution, it is clear that mobile devices and apps are changing every aspect of our lives. From news consumption, to photo sharing, to gaming, to hailing a cab to depositing a check, every moment has become a mobile moment. In fact, most consumers who have a smartphone or a tablet can’t imagine their lives without these devices and apps. We have become addicted to instant gratification and the back pocket proximity of powerful computing technology. At Flurry, we have been at the epicenter of the mobile revolution for more than five years now and today we see activity from more than 300,000 apps and three billion app sessions every day, giving us a unique vantage point into the behavior of over a billion worldwide mobile consumers. Today, SourceDigital13 we are sharing a peek into a day in the life of a U.S. adult mobile consumer. (We’ll blog some other parts of my keynote in future posts.) For this depiction (see chart below), we have used a random sample of 15,271 U.S. iOS users and we measured their app usage throughout the month of May, 2013. We also cut the data based on a 24-hour cycle to help understand the usage throughout an entire day. App usage steadily increases over the course of the day and ultimately peaks in the evening (unlike TV which remains low then has a dramatic jump in the evening.) This is a big change of perspective for media planners who have been used to weighting their budgets toward evening TV. In an app-centric world, that spend could effectively be spread throughout the day given consumers are reaching for their devices consistently throughout their waking hours. Wearable computing already arrived with the smartphone. Our data confirms what many of us know from experience: smartphones, tablets and the apps installed on them appear to be glued to consumers 24/7, 365. They are with us when we wake, work, exercise, eat, play and yes, even when we sleep. We have entered the era of “wearable computing” without needing the wearable gear. Even ahead of the mainstream adoption of Google Glass or Apple’s rumored wrist device, consumers are already embracing the wearable lifestyle with smartphones and tablets. While gaming still consumes a large portion of the time spent on devices, other categories appear to be closing the gap when it comes to consumer attention. With the proliferation of social and photo sharing apps, consumers are switched on and sharing every aspect of their lives. Shopping and lifestyle apps are used around the clock. Breakfast time, lunch time, dinner time and bedtime have become shopping time. We drilled further into the app usage of young adults age 25-34, a highly-desired segment for brands and advertisers. That segment of the population enjoys high disposable income and has traditionally been a prime target of CPGs, travel, entertainment and retailers. In the next chart, we have analyzed how app usage by this group indexes against the overall population. (In this chart, 0% represents average usage across all age groups. Positive percentages reflect the degree to which app usage for the 25-34 year old age group exceeds that of iOS users in other age groups.) The results surprised us. Given the popularity of game apps you might expect that Millennials drive that usage, but in fact they under-index for game app usage. It’s turns out that it’s the middle aged Gen X-ers who grew up with gaming consoles who are over indexing on games. Millennials also under-index on time in Utilities and News than the rest of the population. The categories in which Millennials over-index are Sports, Health and Fitness; Music, Media and Entertainment; Lifestyle and Shopping. We then went one step further to break down gender usage within the 25-34 age group. The results are shown in the chart below. Females age 25-34 dramatically over index in the Sports, Health and Fitness category. 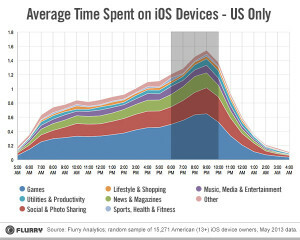 They spend over 200% more time in these apps then the rest of the population. Women gravitate toward self-improvement related apps while men gravitate toward entertainment. Males age 25-34 over index in Music, Media and Entertainment as well as Social and Photo-Sharing. They under-index in News & Magazines. Confirming some age-old stereotypes, women 25-34 also over-index in Lifestyle and Shopping in which they spend 75% more time than the rest of the population. Even with more than a billion worldwide active devices, we are still in the very early days of the mobile consumer age. New apps and experiences are emerging daily. In the blink of an eye, experiences such as Ubering (the new verb for ordering a cab using the popular Uber app) and Snapchatting (in reference to using SnapChat to exchange ephemeral photos and videos) have arrived in the mainstream of society and soon, we predict, the English dictionary. Just three years ago these experiences, 100% powered by our mobile devices, didn’t even exist. Many things will change over the next few years but we predict that mobile devices will become even more a part of the fabric of society than they are today. That means marketers and advertisers need to learn how to make mobile a central part of their marketing and media plans, not just an afterthought.